Poet Jennifer K. Sweeney: This poem has a different sort of voice than others I’ve written. Maybe it is the kind of voice we might use sitting next to a stranger on a bus, or the kind of voice we might collectively hear in a café from many different speakers circling in their own centers of talk. It’s a voice that wants to reach out warmly to someone they don’t know but not say too much. Just enough to relieve the burden and briefly light the trees. Artist Kate Baird: I responded to the zooming out from “your life” to a geological time frame, and also to idea that things are both incredibly tenuous and incredibly not tenuous, like those dragonflies. Poet Jennifer K. Sweeney: I thought there might be some interpretation of impermanence, a kind of blurriness in the flux. Flux does inform Kate’s work here, but I am delighted at the collage of forms here, the textures, the lines. Artist Kate Baird: I was interested in representing the passage of time through stacking, like sediment. Also the material properties of the rice paper roof and the line made by the train tracks into the ocean and the delicacy of a stuck wing. Poet Jennifer K. Sweeney: Kate heightened it, made the transformations of the poem more tactile for me. The poem stays with the inbetweenness, the unknowing, and that has caused me to experience this poem mostly on an interior level. I realize now that I held the “perhaps” with the most weight when writing it. The visual interpretation sharpens the imagery for me, images that emerged somewhat subconsciously, and that I didn’t fully see until I saw them here. Poet Jennifer K. Sweeney: How Kate enacted couplets via mixed media! I love the strata of the pieced elements, the watermark of image-layers beneath the text as well. All the lines of motion spiraling or angling in different directions, and those wings etched and displaced just so. Artist Kate Baird: I said that one of the things that drew me to the poem was the idea of stacking, or layers upon layers. I hadn’t thought of the printed poem also having that visual property until I saw the finished broadside, where it’s very apparent. Also I love the slightly off-kilterness of the broadside’s composition. Poet Jennifer K. Sweeney: Yes, my father had always wanted to be an artist but alas, became an accounting professor instead. When he turned sixty, he completed an undergraduate degree in art at the university he where he taught and became a gifted printmaker. Having this new creative access to my father, I began writing poems to accompany his art. It was a treasured and illuminating call and response. The top panel in Kate’s piece looks so much like a linocut he did a few years back. It’s almost as if a little fragment of that energy entered the work here. Artist Kate Baird: I read all the time, and reading for me is very related to making things. When I read, I’m bringing things, places and people into being in my mind. When I make things, I’m taking the jumble of people, places, interactions, memories, etc. in my mind and sifting them into some kind of physical/material order. Both reading and making things are ongoing, flowing sorts of mental processes that could turn out or be imagined a million other ways. Maybe another reason I was attracted to this poem was because of the title. 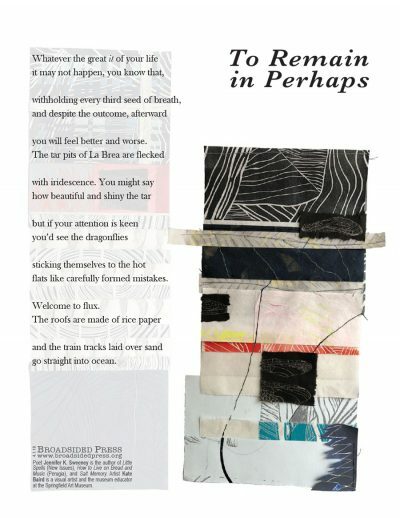 “To Remain in Perhaps” is a pretty great description of both reading and making. Poet Jennifer K. Sweeney: It would be the kind of music nature makes with the made world. Rain dripping into bottles, wind whipping nets into forms, a storm’s tin beating. Artist Kate Baird: Maybe a recording of ambient sound in a place where there are no people? Poet Jennifer K. Sweeney: I’m reading tiny books as companions lately. Last week, a slim little marvel: On Imagination by Mary Ruefle. And Devotion by Patti Smith. Artist Kate Baird: Sing, Unburied, Sing and Salvage the Bones (Jesmyn Ward), Little Disturbances of Man (Grace Paley), Lincoln in the Bardo (George Saunders), Esther Stories (Peter Orner). Poet Jennifer K. Sweeney: I’m sorry to say I have not in person. Hungry for it. Artist Kate Baird: There’s a beautiful room of Richard Tuttle prints right now in the museum where I work. They’re about to come down, so I’m trying to spend a little time with them each day. Poet Jennifer K. Sweeney: I would add the credit that the title comes from a casual description of the lyric poem in the book Lyric Postmodernisms. A wonderful book! Jennifer K. Sweeney is the author of Little Spells (New Issues Press), How to Live on Bread and Music (Perugia Press), and Salt Memory. 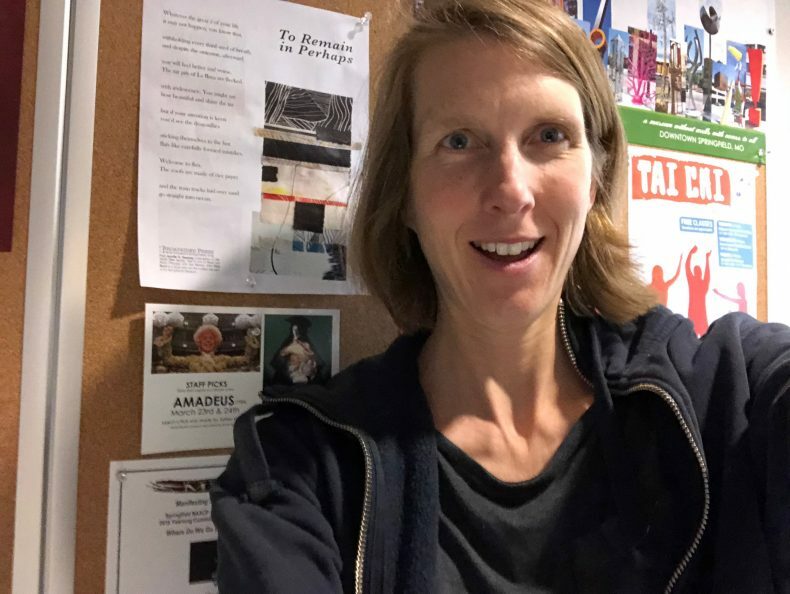 The recipient of the James Laughlin Award and a Pushcart Prize, her poems have appeared in American Poetry Review, The Awl, Kenyon Review, New American Writing, Passages North, Poetry Daily, Terrain, and Verse Daily. 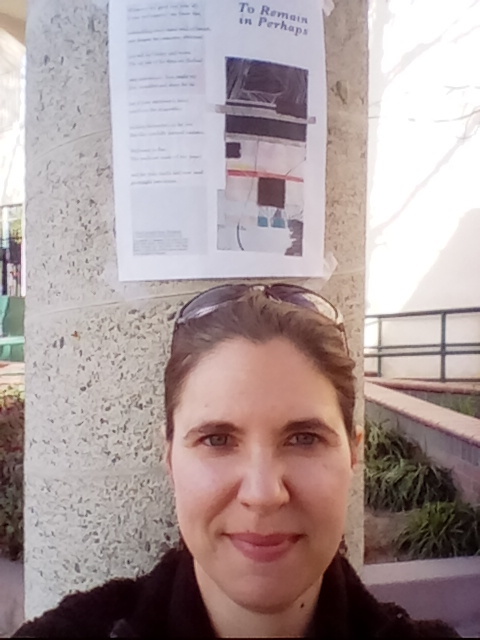 She lives in California’s Inland Empire where she teaches privately and at the University of Redlands. Kate Baird is a visual artist and the museum educator at the Springfield Art Museum in Springfield, Missouri. She is also a founder of Placeworks, a multi-disciplinary arts program for rural schools which collaborates with teachers and students in more than 30 communities in southwest Missouri. Kate Baird sneaks a little more art into the Springfield Art Museum.